With crisper nighttime temperatures and daylight shortening, my children are gearing up for the next holiday. It’s not Labor Day, silly, but Halloween they have on their brains. Costumes are being selected, spookiness is IN! My daughter’s favorite holiday is not Christmas, not her birthday….It’s HALLOWEEN! 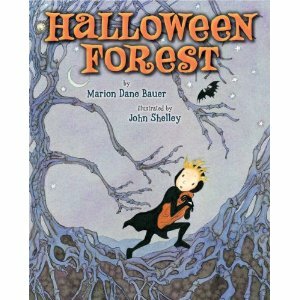 Halloween Forest by Marion Dane Bauer and illustrated by John Shelley is about a child’s adventure into the woods, where everything appears as bones. If you take your trick-or-treat sack and venture into the dark woods on Halloween night, you�ll find cat bones, rat bones, and bat bones�and all are looking at YOU! “Take care! Beware! Despair!” the bone creatures cry. “You can bet you’ve just met your worst nightmare!” What will you do? Cry? Sigh? NO! Because you�re too tough / to worry about stuff / like the rattle / and prattle / of bones! This book is told in umetered rhymed verse giving read alouds a flowing nature. The illustrations are well done and may inspire your own Halloween bone artworks, as well as poetry. If you have ever walked into a forest after a fire, the trees definitely appear to have skeletons. This image was present for me as I read the book. As far as I can tell, there is nothing green about this book. BOO HOO! I really wish publishers would use at least recycled paper.